Happy Hour Pay Day Thief Smeargle for all! Topic: Happy Hour Pay Day Thief Smeargle for all! I recently got a secret base of someone's Smeargle who knew Happy Hour, Pay Day, and Thief. It took me much longer than I would have liked to get the correct moves (he kept using Thief! I wanted Happy Hour!) and I had to take advantage of Blissey Bases as well so I could Sketch moves on to Smeargles and level up for more sketching while the Blisseys Toxic'd themselves out. It was... frustrating to say the least, so I spent the last couple hours developing a secret base to solve this dillemma. It's located in Route 120, in that bush near the really pretty pond. Best way to get there is fly to Route 121 and then head from there. Bring a low-level Smeargle, 1-5 is ideal, for a pain-free Doubles Battle. The first Pokemon is a level 7 Smeargle named "Happy Hour." Guess what move it has. As long as your Smeargle is outsped by this guy (he's Jolly, not sure what his speed stat is at the moment but I can find it) you should be able to Sketch the Happy Hour right off the bat. Happy Hour's teammate is a level (currently 58) Blissey that knows only Healing Wish. It's holding a Full Incense, ensuring that it'll go last in its priority bracket. So you Sketch Happy Hour on your first turn, and then Blissey faints, granting you (hopefully) enough exp to learn Sketch again. Then out comes the second Smeargle, a Level 1 guy named "Pay Day." Again, he knows only Pay Day. From here, you can Sketch Pay Day on your Smeargle. And you're pretty much set to go! You can bring out other Smeargles to Sketch the moves, or you can just KO those two. Either way, happy money-making! 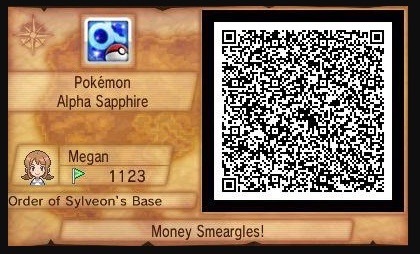 Hopefully you can get a Smeargle to learn Happy Hour here, Having Pay Day and Thief is a nice bonus too. I wouldn't mind getting a Happy Hour Smeargle, but I don't think I'm far enough in ORAS to get to the base on Route 120. It would be nice if someone here could make a few Happy Hour Smeargle and pass them around. EDIT: I've discovered I can unlock the Happy Hour Inkay Mystery Gift event using my Action Replay, which Bank considers legit when trying to see it in the box. I will be willing to trade one with you if you want one. Re: Happy Hour Pay Day Thief Smeargle for all!